All of us, who know and love rats, have at least an inkling of what they are capable of. We watch our rats and marvel at their curiosity and agility, but how often do we actually take stock of our provision for them? As far as is possible, the life of a domesticated animal, should offer the opportunity for exploring all of the natural behaviours of the species, with the obvious exception of reproduction. “Enrichment for rats” essentially refers to the provision of a habitat and experiences that can provide for these behaviours. Some of these behaviours – like foraging – can easily be offered every day, simply by scattering the food ration, rather than bowl-feeding. 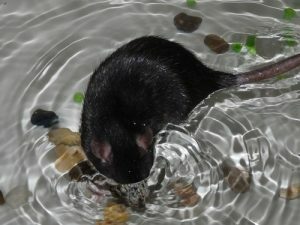 Others – like swimming – will not appeal to every rat, but can bring an added pleasure to the life of many rats, as a ‘now and then’ activity. Deep litter allows for digging, and if you scatter feed this will encourage it. Ropes, perches, barred cages and fruit tree branches all enable climbing, balancing and jumping. Hammocks, shredded paper, kitchen roll, old telephone directories, hay and fleece all create opportunities to build and maintain nests, and in doing so enables rats to carry material around the cage. A litter (substrate) with substance, such as chopped card, also enables carrying and nest building. Boxes, igloos, hanging baskets and hammocks give multiple sleeping choices, but you’ll still always get the odd rat who sleeps in the litter tray! Food hung up in awkward spots around the cage creates problem-solving opportunities and allows for climbing, jumping and balancing. Unless your cage has a really big footprint, free range time on the floor will give the best running opportunities. However, in-cage wheels of a suitable size, give a different kind of running experience and are enjoyed by many rats. Blocks, branches, wood and plastic all give rats a chance to gnaw, as do nuts in their shells. Rattie company provides for social interaction and grooming behaviours, and these will spill over to favourite humans too! Swimming may not appeal to all rats, but shallow water play, such as pea fishing or collecting small stones is enjoyed by most. Watching your rats engaged in this kind of play, makes it easy to pick out those who might enjoy the change to encounter deeper water. 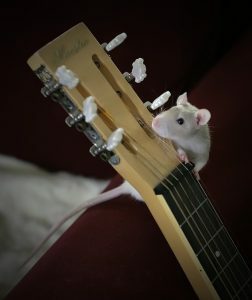 100 Free or cheap toys and activities to enrich your rats' lives. Previous Previous post: Can your pet rat be a vegetarian?